Until someone out there introduces a universally free household cleaning service, most of us will continue to tackle the less-than-thrilling task of cleaning our own homes each week. Still, you can make this routine task more pleasant, and shave precious moments off your overall cleaning time in the process. This house cleaning schedule can help you make quick work of cleaning. The way Mom taught you to do dishes - wash lightly soiled cups and plates first, scrub the dinner pans with baked-on food last - works equally well for cleaning your home's surfaces. Scrubbing with murky water or soiled sponges redistributes dirt instead of removing it. Your new house cleaning schedule will start you off cleaning in the lightly soiled bedrooms, dining room, and living room. And after you've completed those areas - and with a sense of accomplishment - work your way into the more challenging kitchen and bathroom. The major culprits found in the bedrooms, dining room, and living room are dust, tracked-in dirt, and clutter In each of these rooms, you'll use essential the same method to clean. Move clockwise around each room, putting away surface clutter or mislaid items. Stash outside the door any stuff that doesn't belong in the room. When you run out of clean areas on the rag, either get a fresh cloth or rinse the used one clean, then twist it dry to remove any excess water. Make your mirrors and windows shine using glass cleaner (or a vinegar-and-water solution) and squeegee. Vacuum upholstered chairs and sofas, and take decorative pillows outdoors to shake the dust and airborne dirt out of them - or fluff them up with a 10-minute tumble in the dryer. Vacuum-clean curtains or drapes. Change bedroom linens. Finish each room with a quick surface vacuuming, and spend a few extra seconds vacuuming near the doorways. Now you're ready for the more challenging kitchen and bathrooms. Not to worry - this house cleaning schedule makes quick work of these challenge, too. Kitchens are a potluck of dirt, grease, and germs. For this room you'll need an all-purpose cleaner; a disinfectant cleaner; a glass cleaner (or a vinegar-and-water-mix); dishwashing detergent; a clean, dry cloth; a scrubber sponge; and a scourer (the ball-shaped, woven plastic kind). The following seven-step method begins with decluttering and ends with mopping your way out the door. You treat the prime surfaces that need weekly attention, letting the specialty cleaners do much of the dirty work for you. Then your job is simply to go back and wipe all the surfaces clean. Step one. Declutter. Put away anything that's out of place, such as dishes languishing in the sink or the kids' homework on the kitchen table, and remove everything from the counters. Send oven mitts and dishtowels into the wash. Toss anything that's past its prime (see how long food lasts for guidelines) or that the troops are unlikely to consume. Step two. Spot patrol. Don't waste your precious time scrubbing dried-on foods or baked-on spills on the countertops and the stove; instead give them a generous spritz of all-purpose cleaner. Allow the cleaner to penetrate the grime while you move on. Step three. Soak it up. Fill the sink with hot, soapy water and place your stove-burner rings and vent-hood filter inside to soak for at least 15 or 20 minutes to soften the baked-on food spills and splatters. Step four. Oven duty. Open the (cool) oven and remove the oven racks. Scrape off any burned-on stains with a dull knife held at a 30-degree angle. Use an oven cleaner for manually cleaned ovens; if you have a self-cleaning oven, simply turn it on and let the appliance clean itself. Don't use an oven cleaner in a self-cleaning or continuous-cleaning oven, however; it may damage the surface. 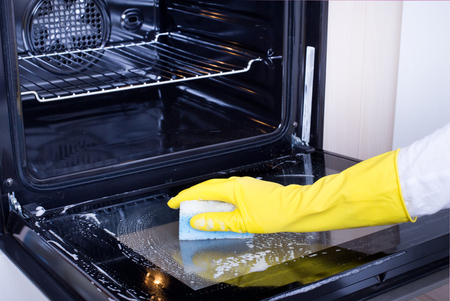 For baked-on messes in the microwave, apply hand dishwashing detergent using your scrubber sponge; rinse clean. Step five. Surface duty. After you've obliterated the baked-on messes in the oven, work your way around the kitchen cleaning the other surfaces. First, wipe up the spots you sprayed in step two; then use an all-purpose cleaner for general wipe down of countertops, the oven exterior, cabinets, dishwasher, and refrigerator. To prevent streak marks when cleaning large vertical areas such as appliance surfaces, start at the bottom and work up, overlapping areas with a circular motion. Rinse the sponge and reapply cleaner frequently. Step six. Finishing touches. Retrieve the vent-hood filter and stove-burner rings that are soaking in the sink; sponge them clean of any lingering grime; rinse, dry, and put them back in place. Clean the sink faucet with a sponge and dishwashing liquid or all-purpose cleaner to remove any reside. To make the faucet sparkle, spritz it with a glass cleaner and polish dry. 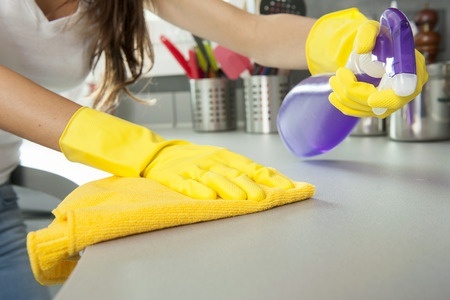 Wipe the countertops and refrigerator door handle clean of disinfectant. Step seven. Floor time. Sweep first to get rid or corner crumbs and then mop with a floor-care product designed for your floor type. If you spot-clean spills immediately after they happen, your floors will stay cleaner between moppings. With just four basic products you can get the bathroom cleaning job done: an all-purpose cleaner; tub, tile, and sink cleaner; a toilet-bowl cleaner; and a glass cleaner. You'll also need the correct tools: a long-handled toilet brush, a scrubber sponge, a dust cloth, and paper towels. You can save time by spraying cleaners on areas that will benefit from some extra soaking time - such as the toilet and tub or the shower - and tackling other surfaces while the cleaners do their stuff. The simple seven-step method that follows will have you in and out - and your bathroom buffed - in minutes rather than hours. Instead of endless scrubbing, let the cleaners penetrate, so that all you have to do on most surfaces is wipe them clean. Step one. Sanitize the bowl. Squeeze some of the toilet-bowl cleaner around the inside of the bowl and under the rim. Use a long-handled toilet brush to swish the cleaner around the bowl, under the rim, and as far into the trap as possible. Let the solution stand a few minutes as you clean the seat, lid, and outside of the bowl with an all purpose cleaner and a sponge, cloth, or paper towels. Step two. Tame the scum. Soapy buildup makes for unsightly baths. Spray the shower or tub and sink with a tub, tile, and sink cleaner. Let it sit while you complete the remaining steps. Step three. Wipe the deck. Clear the countertop of personal items and spray the surface with all-purpose cleaner. Wipe clean with a sponge or paper towels. Replace your toiletries. Step four. Shine it. Spray glass cleaner on a cloth and wash the mirror's surface. Squeegee dry. Use glass cleaner to make the faucet sparkle, too. Step five. Dust and smudge duty. Clear shelves and dust; spot-clean wall smudges with an all-purpose cleaner and sponge. Give full attention to areas around light switches and doorknobs. Step six. Surface scrubbing. Use a scrubber sponge to loosen and remove soap scum and buildup on the tub or shower. To make your job easier in the future, keep a squeegee in the shower or a sponge in the tub for quick wipe-downs of the shower walls and door or the sides of the tub to help prevent soap-scum buildup. To keep mildew in check, open the shower door or curtain after use to let it air-dry. Step seven. Vacuum or sweep. Then mop the floor clean. Empty the trash can and take the bag with you as you go.